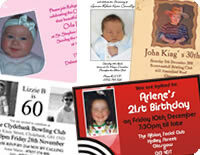 We supply A5 birthday invitations throughout the United Kingdom. All invitation card printing prices include delivery. We us next day couriers to dispatch your print work. Premier artwork - Our creative design team will create an effective design and quality artwork for your invitation cards. Free mailer card artwork checks or low-cost design and artwork. We offer a competitive nationwide birthday party invites, event and function invitation card printing service to and the following areas of the United Kingdom.